The passengers on the Lion Air 610 flight were on board one of Boeing’s newest, most advanced planes. The pilot and co-pilot of the 737 MAX 8 were more than experienced, with around 11,000 flying hours between them. The weather conditions were not an issue and the flight was routine. So what caused that plane to crash into the Java Sea just 13 minutes after takeoff? More than two weeks after the catastrophe, investigators are still piecing together the clues. As they do, the focus has turned to Boeing, which allegedly failed to tell pilots about a new system feature implicated in the crash — information that aviation analysts say could have possibly saved the lives of all 189 people on board. A lawsuit against Boeing related to the crash was filed Thursday. The parents of one passenger sued the company, claiming that the downed plane, a 737 MAX 8, had an unsafe design. The suit alleges Boeing failed to communicate a new safety feature that hadn’t existed in previous 737s. Lion Air’s operational director has accused Boeing of withholding information from pilots in the manuals about a safety feature that automatically lowers the airplane’s nose to prevent or exit a stall. Boeing Chief Executive Dennis Muilenburg told Fox Business Network on Tuesday that information was available as part of the training manual. “We are confident in the safety of the 737 MAX. Safety remains our top priority and is a core value for everyone at Boeing,” the spokesperson said. CNN has spoken to nine aviation experts, including pilots who fly the 737 MAX 8 planes, about the crash. While they all emphasized that only a complete investigation will give a full picture of what actually happened in the cockpit that morning, all have concluded that, in one way or another, Boeing’s actions fell short — leaving not only the families of the victims shaken, but also the aviation industry. 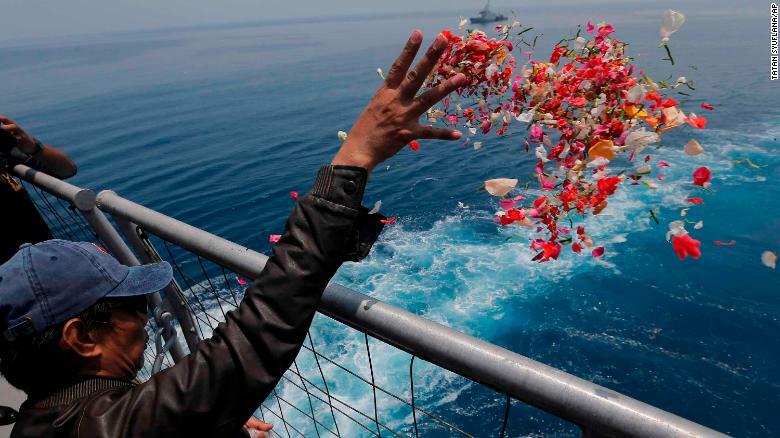 A relative of one of the crash victims tosses flower petals from an Indonesian Navy ship on Tuesday, November 6.